Thinking of remodeling your bathroom? 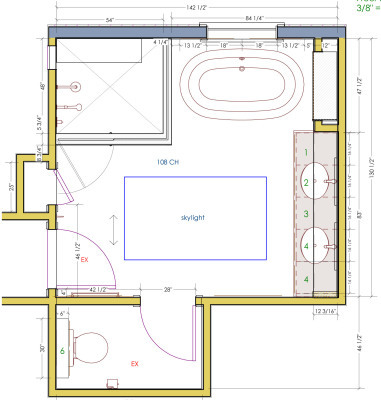 ​​A successful bathroom remodel project begins with a detailed plan and a team of highly skilled craftsman. By Choosing James Anderson LLC Design and Build Co, you will be personally working with a true professional, a master craftsman who can bring your idea to reality. 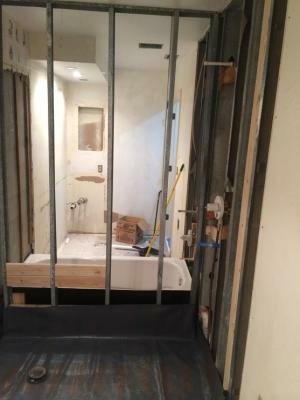 James personally brings over 30 years of hands-on experience in bathroom remodeling and renovations with comprehensive knowledge in bathroom designs as well as the construction, mechanical, plumbing and electrical systems. When it comes to your bathroom renovation there's simply no such thing as a minor detail. 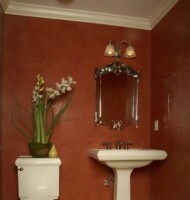 A well known experienced and reliable licensed bathroom remodeling company is what you'll need to accomplish this task. That's why unparalleled attention to detail is a defining hallmark of our company. We gaurantee it! Your dream bathroom, designed just for you! The possibilities are almost infinite in bathroom designs. Fabulous fixtures can be customized into redesigned spaces and can turn any ordinary bathroom into a luxurious retreat that's comfortable and inviting. Texture, color and dimensions are defined by our unique bathroom designs with the use of porcelain, glass or marble and travertine tiles, decorative plumbing fixtures, granite countertops, and bathroom accessories. 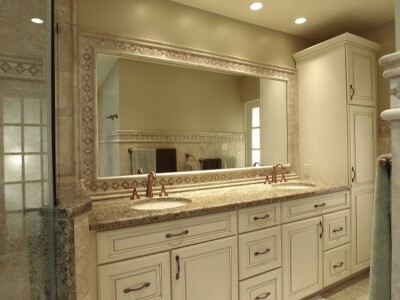 Our bathroom vanity cabinets provides elegance and functional storage with a multitude of styles and finishes to the exclusivity of custom designed and hand made cabinetry. If your bathroom has a tub/shower combination, or an old outdated shower with a tall step-in-height that is impractical or dangerous for you and your family then it's time to replace it. Choosing a licensed contractor to do this can be a complicated process. However, our process is proven-tried and true. 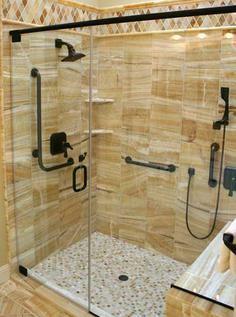 When we remodel your shower, you will never need to worry if it was done correctly. 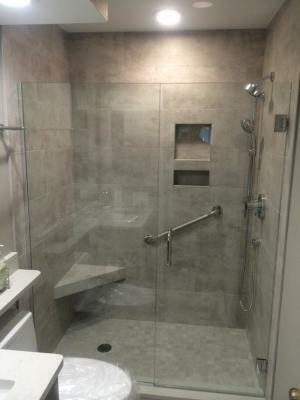 We have remodeled hundreds of bathrooms and trusted in the finest homes and condos in Sarasota areas for quality bathroom and shower renovations since 2004. Getting started with your bathroom remodel is easy. Just contact Jim Anderson direct to discuss your project. Trusted and approved by ​all high-rise and Condo HOA's for competency & experience. PROJECT: Entire bathroom makeover with walk-in shower installation and remodel in "The Meadows Country Club", Sarasota, FL. 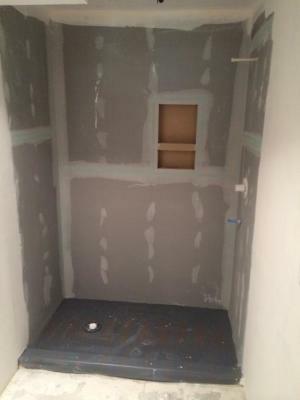 Installation of Hardie board shower tile backer, built-in shampoo niche and installation of water proofing mastics. 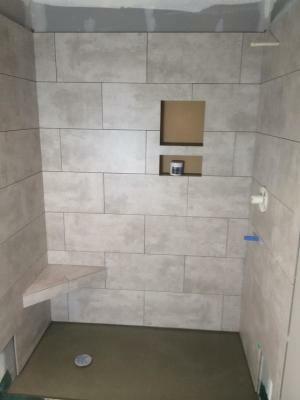 Installation of shower corner bench, float shower pan with bedmud, Install large 12X24 porcelain tile subway style with minimal grout joint. Shower installation floor tiles, and grout. 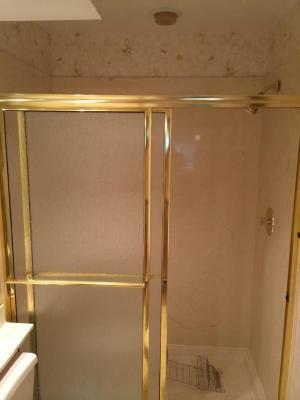 Install custom frameless shower door glass, hand rail and plumbing trim. A beautiful shower transformation every time. 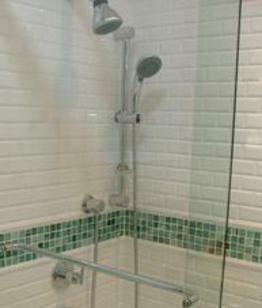 Shower transformation process: Design, material selections, delivery of all necessary materials, start date and schedule. Demolition, plumbing fixture installation, waterproof shower pan liner installation, framing repairs and shower curb sill. For many homeowners in the Sarasota areas, the bathtub may not be a usable fixture that fits their daily needs. 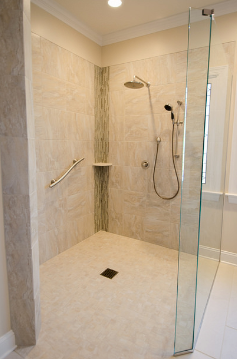 Many people want the ease and convenience of a walk-in shower installation, or the safety benefits that can be incorporated. For our aging clients, they want to stay in their home or condo as long as possible. Trouble is, their homes may not be aging as well as they are. 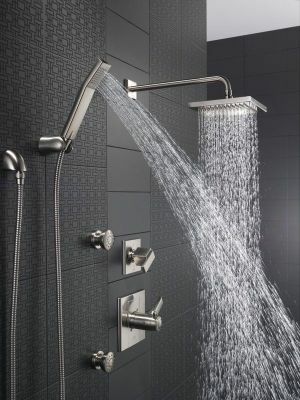 The type of adaptable designs to a bathroom remodel have come to be known in the building industry as "Aging in Place" where the newly remodeled bathroom will be safer and easier to navigate with a new tub-to shower installation and renovation with a large walk-in shower, grab bars, comfort height toilets, taller vanity cabinets and better lighting. As an experienced bathroom designer, we also incorporate the "Visitability" bathroom renovation where these safety features become part of the new design trends and welcomes people of all ages and abilities. 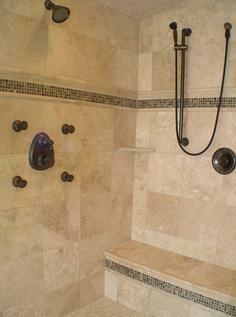 Bathtub-To-Shower installation and transformations are permited inside either single homes or High-rise Condominiums. We provide complete bathroom design service and remodeling, including walk-in and ADA showers, Walk-in tubs, Jetted and deck tubs, specialized vanity cabinetry, construction, electrical and plumbing services. Finding the right vanity to fit your new bathroom design is easy with us. Whether you want a single, double, or custom vanity, we are custom cabinet experts and can provide any style, shape, or color. No matter what your vision for your ideal bathroom remodel may be, we have the experience and expertise to bring it to life. 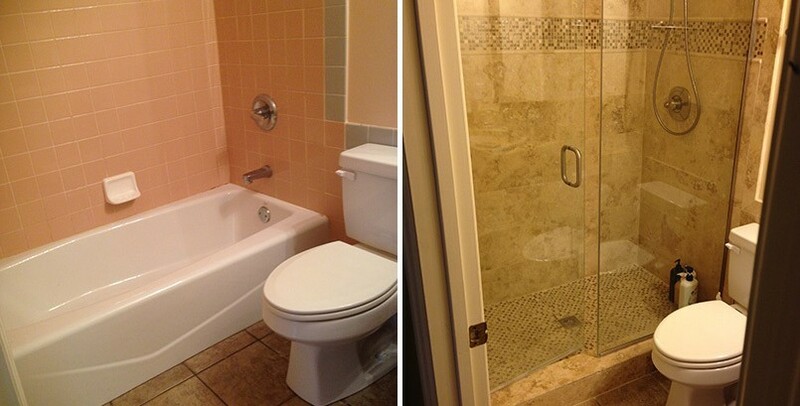 We pride ourselves on creating innovative solutions for your bathroom remodel project. There’s no question that a bathroom remodel in Sarasota and Venice Florida areas has many advantages, whether you’re planning to sell in the near future or you’re looking to remain in your home for years to come. One of the biggest benefits of giving your bathroom a fresh new look is the outstanding value that it can add to your home. 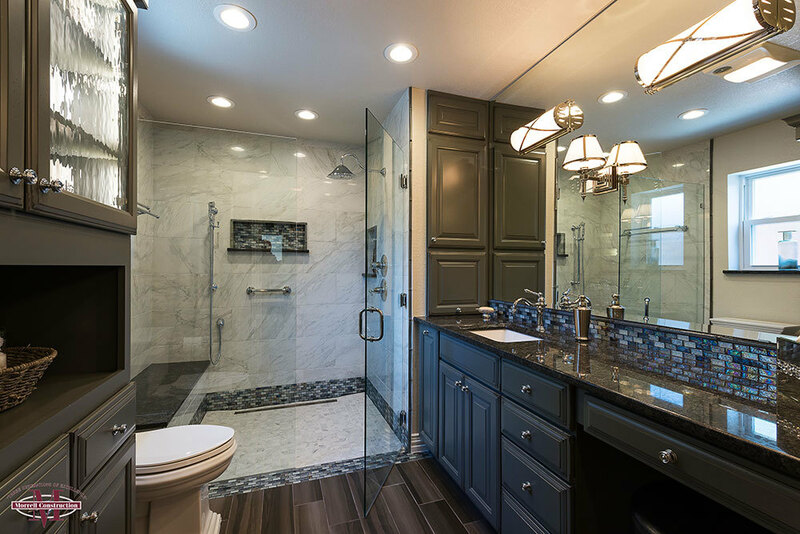 According to the National Association of Realtors, the average bathroom remodel can add roughly $38,000 to the resale value of your home, and it offers one of the most beneficial cost-to-value ratios you’ll find in any home improvement project. No matter what your vision for your ideal bathroom renovation may be, James Anderson LLC Design & Build has the experience and expertise to bring it to life. We pride ourselves on creating innovative solutions for bathroom remodeling projects that will not only provide remarkable functional value, but will be gorgeous to look at as well. We also believe in straightforward business practices, which means offering accurate good faith estimates and faithfully adhering to our project time frames. Just research our history with past clients, and you will quickly see that we offer uncompromising quality and superior craftsmanship with every project we undertake. As our clients would attest to, James Anderson provides the customized bathroom remodeling Sarasota and Venice homeowners prefer. Contact us today so that you can take your first step towards creating the bathroom you’ve always envisioned. Dreaming of a new luxury bathroom? Buying a new home with an outdated bathroom? 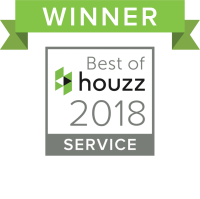 We can provide you with the design vision, value and results you’re looking for. From high-end remodels to stylish makeovers, we offer creative design ideas and expert advice for kitchen and bathroom remodels of all sizes, styles and budgets. Our unique design service is personalized, convenient and affordable. It's an easy way to get started on your project with smart advice and beautiful material recommendations for your project. 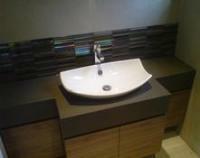 Your design purchase will apply towards your project if you hire us to remodel your bathroom. Getting started on your new Bathroom remodel is easy. Simply call or email James Anderson direct. We look forward to hearing from you! 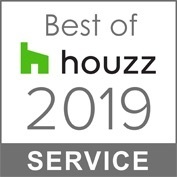 ​James Anderson has been Awarded "Best of Houzz" five years in a row for exceptional client satisfaction in Kitchen and Bathroom Remodeling in the Sarasota & Venice Areas.